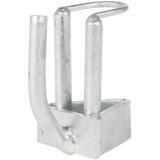 Use with Steel T Posts to support the SupaReel™ handles. Remove the 2-prong portion from the triangular piece. With the finger-like projection of bracket pointing up, slide the triangle-shaped bracket over top of T-post and position at desired height. Place the triangular bracket so it is between 2 studs on front of post. Slide the angle iron attached to back of SupaReel's carry handle over the finger of bracket. 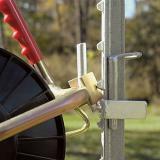 Tighten conductor as needed and turn the locking key (on end of carry handle) 180 degrees forward to lock reel in place. We have several of these that we use to hold our reels to T posts. They work well.